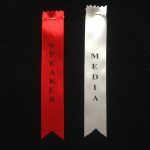 Personalised ribbon can be the ideal solution for a whole range of events or occasions. 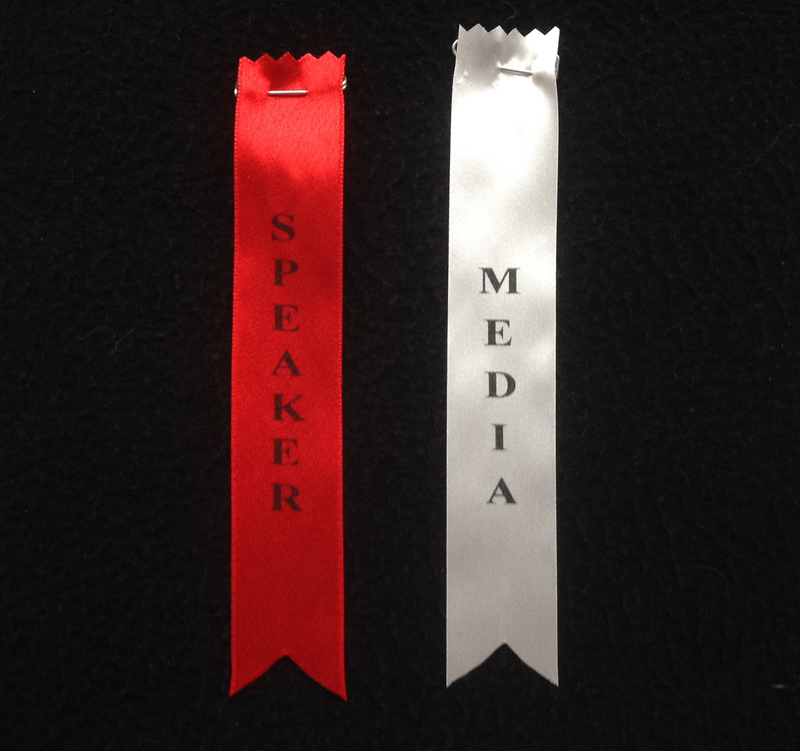 We can print personalised ribbon in widths from 15mm, through 25mm and 45mm to 100mm width. the length can beanything within reason. The text, colour and ribbon colour is your choice. Our only comment on this is that colours look their best on the paler coloured ribbons and the silver metallic and metallic gold looks good on all ribbon colours. 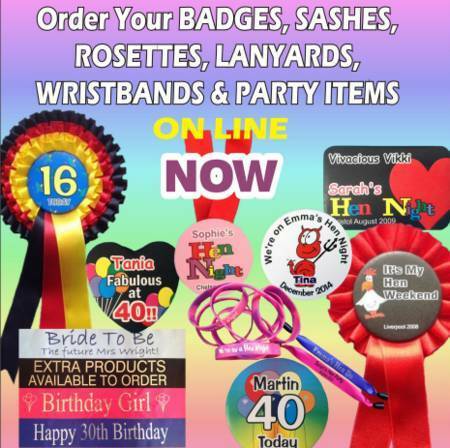 The occasions when a personalised ribbon can be used are many. Campaign ribbons are probably best suited to 15mm. We suply them with a small safety pin. 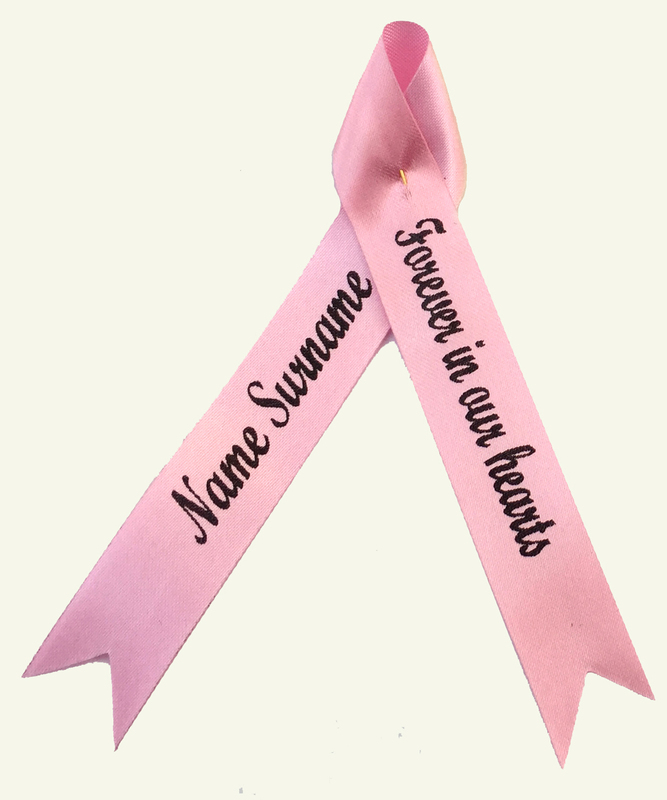 This style of ribbon is also ideal as a discreet symbol that can be worn at a funeral or memorial service. Lapel ribbons which can are also supplied with a small safety pin and usually printed vertically are best in a width of 25mm. Typically these are supplied to conferences or to competition / exhibition organisers to signify judges , the press, speakers etc. If you are looking for lengths of ribbon for, say, a wedding car, then something like 45mm is probably best. White ribbon with silver text printed in a repeat pattern is perhaps the most popular choice for this application. The widest ribbon that we can print is 100mm, which is also the ribbon that we use for our sashes. But of course, this is not the only use that this width can be used for. It is also ideal as table runners or for a ribbon cutting ceremony. Banners can also be made out of this width of ribbon. 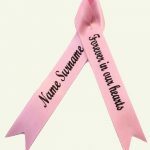 As regards the printing of the ribbon, you can choose to have it repeated at certain intervals, or to have it centred over a given length or printed continuously. It’s personalised for you, so it’s your choice.